I’ve gotta little treat to share with y’all today. Ya know, it’s Monday and I’m here to make you smile because it’s the start of a new week! And just in case you need a dessert, I’ve got ya covered. This recipe is so super-duper easy that you can easily make it with your kids, grand-kids, young pals….you get the picture. Kids can help and it’s a fun little baking project that they’ll love to be a part of. But if you don’t have any wee ones nearby- no worries. I don’t have any over here – but then again I’m like a little kid so it makes perfect sense as to why this recipe turned out perfect when I made it with my Mom last week. I’ve had such a good time baking with my Momma these past few years that I’ve been working for myself. She’s hysterical and cracks me up when I’m gettin’ busy in the kitchen. I have come to a deep appreciation for muesli. Bob’s Red Mill just came out with a new gluten-free muesli and it’s pretty much rockin’ my world right now. I mean seriously it’s a bag of your favorite ingredients all jumbled together- what more can you ask for? Well, maybe you’ll want a bit of almond milk with it. But, in case you’re bored with your usual cereal bowl- I’ve got just the thing to put the ‘Spring’ into your step this week. I recommend buying two bags of this fabulous muesli ’cause you’re gunna want more. You won’t regret it and I’m sure it’ll be eaten in no time in your pantry. 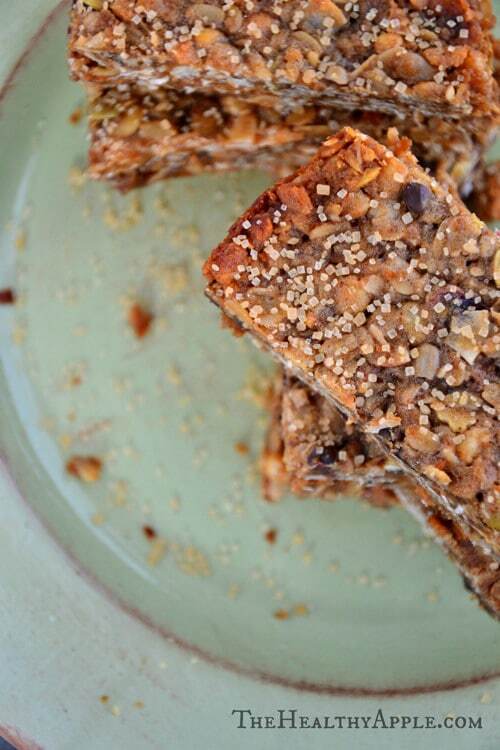 These fun little bars are made by combining an egg white with dairy-free/vegan butter, chunky peanut butter, brown sugar, cinnamon, honey, coconut flakes and a few nuts n’ seeds with the gluten-free muesli. That’s it. The baking dork in me thinks this is pretty cool. It’s total yumminess and reminds me of the bars they make at Canyon Ranch. I’m a big fan. No, Dad it doesn’t taste like birdseed and no, friends it’s not a freaky hippie bar. 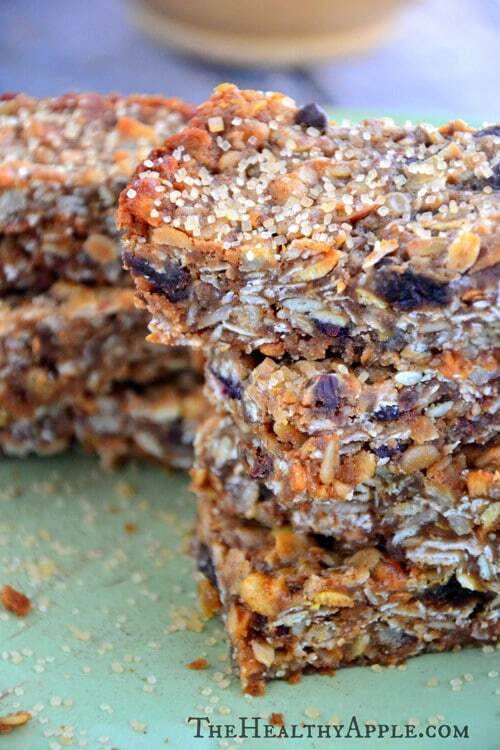 It’s like muesli meets rice crispy treats. I mean, come on … how can you go wrong with that? 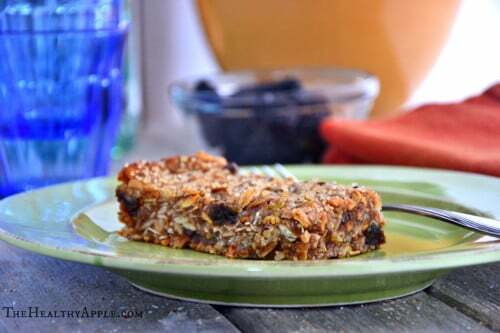 Put a smile on your Monday morning face and if your week ends with a frown by Friday, bake these bars- they’ll bring back that smile in no time. And I’m excited to announce I’ve added a few new PAGES to my blog! They are located on the right-hand side of my blog under the column ‘More Apples’. I thought it would be helpful to give you some helpful information that you can use in your daily lives. Hope you enjoy them; more to come!! Now don’t forget to hop on over to my Facebook Page everyday until April 22nd where I’m giving away new prizes everyday for my ‘Spring Has Spring’ Giveaway. Spray an 8 x 8 inch nonstick baking dish with baking spray. Lay a piece of parchment paper in the pan, allowing the excess paper to hang over the sides. Spray the parchment paper with cooking spray. In a large mixing bowl, beat the egg white until frothy. Add peanut butter, brown sugar and honey. Then, add the melted butter, muesli and pumpkin seeds; mix well to combine. Add remaining ingredients and mix until well combined. Transfer mixture into the prepared baking pan. Press lightly with a spatula to flatten the surface. Bake until the edge of the mixture begins to brown, approximately 20 minutes. Remove from the oven; set aside to cool for 10 minutes then place in the fridge for at least 2 hours or overnight. Cut into rectangles and serve. Awe; thanks love! Miss you and hope all is well. xoxo Have a great week! They look awesome! What brand of peanut butter did you use? I used Peanut Butter & Co’s Peanut Butter! Thanks Vanessa!! This one is really a big treat! So delicious!! thanks for sharing. Thanks Nancy! Hope you enjoy it. Have a great night! Wow. What a great, healthy looking bar! I’m like a kid sometimes too and I love baking with my mom! It’s the best! I’m also totally obsessed with Bob’s Red Mill. I am allergic to chocolate and am about to order some of their carob powder. Do you like it? Wow Amy, you are everywhere! These bars look amazing. So great to hear from you Alisa; I miss you and wish we lived closer. Hope you are having a great week! xoxx Thanks so much for your comment. Muahhh!!! 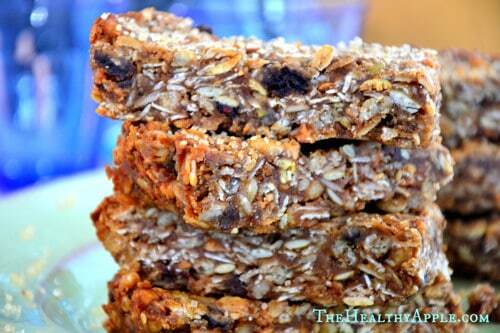 Are these more of a treat since you have them listed as dessert or could I eat these bars for breakfast too? They are fabulous as a breakfast! I just served them to my clients this week for breakfast and they loved them!! These look great. 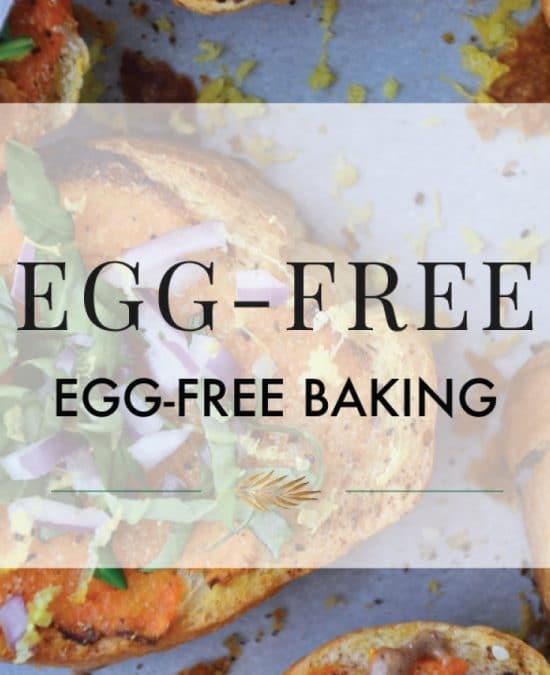 What egg-substitute do you think would work best? My son has multiple food allergies (including egg). 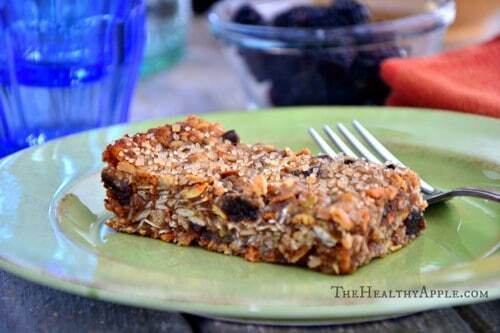 Would a flax egg, applesauce or banana work better? He’s also allergic to sesame, so I suppose the recipe will still work without the sesame seeds? thanks so much! Thank you so much Kathryn; you can try the flax/water combination but I didn’t try that so I’m not sure if it will work. Hopefully it will! 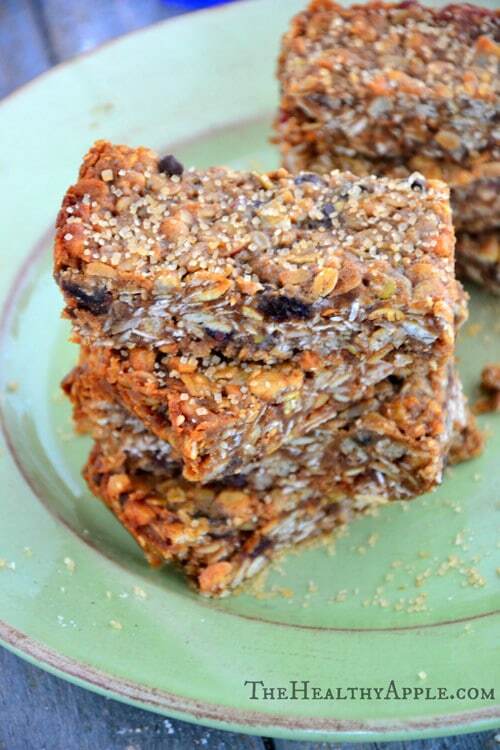 You can use poppy seeds or sunflower seeds instead of the sesame seeds. Hope that helps. 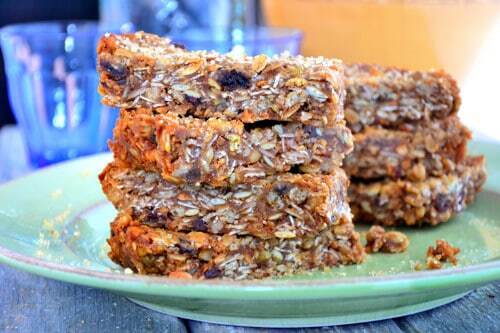 These look so good – like the perfect homemade chewy granola bar. Can’t wait to try! 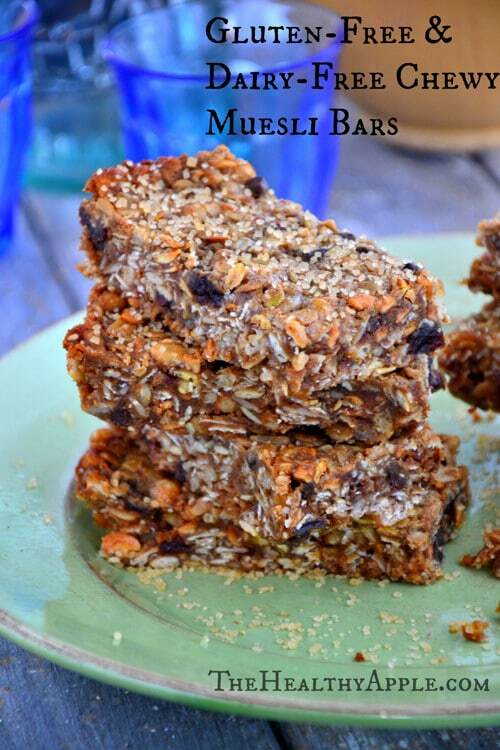 Oh I LOVE muesli, and this looks amazing!! Any suggestions for a substitution for the peanut butter in these? 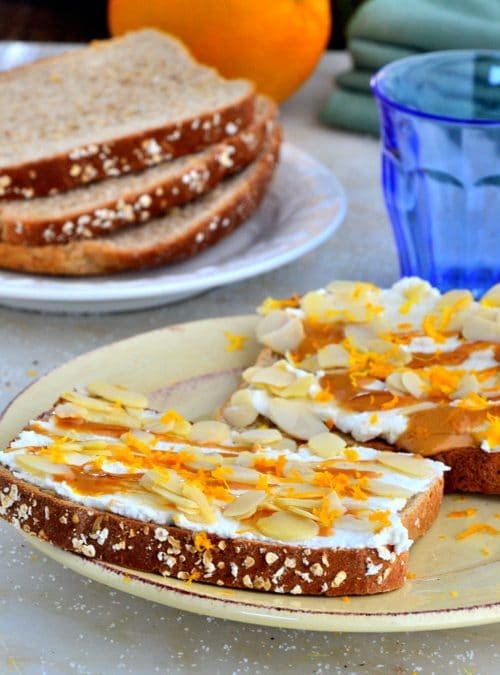 I am allergic to nuts and have a hard time finding recipes that don’t require nut butters. I realised that is good written, easy to comprehend. I congratulate you because of this research that I’ll recommend to the people around. scholar or pupil can find results gpa levels. All good!